Let's be honest. No screwing around. Who amongst us grown ups is dying to be a kid again? If you didn't shout it out loud or nod your head up and down…I most certainly did! Yesterday, I went to pick up my younger daughter from school in what turned out to be a really heavy-duty down pour. I had just come from a meeting and was stuck in a suit and tie…my least favorite articles of clothing to wear. and as innocent as can be. I told her, “Annie, its raining cats and dogs outside. Better stay close to me while we walk home so you won't get wet”. Annie looked at me and said, “Daddy, I love walking in the rain…its warm out and I am hot…the rain will cool me down”. We walked home together…me huddled under my umbrella concerned about getting wet and Annie walking along side me, getting more soaked with each footstep. of our house and continued to frolic in the rain. I stood by the screen door watching her singing and dancing in the rain..removing her pony tail and shaking her wet mop of hair from side to side. She didn't have a care in the world standing outside on that wet spring Wednesday afternoon. All she cared about was making sure she got a good rain soaking. She was just naturally doing everything that I aspire to do…being present, authentic and living in the moment. What happened to us adults? When did we become such “fuddy-duddy's”? When did we stop dancing in the rain? I think about this almost every day as I continue my journey towards enlightenment slowly andgradually peeling away the layers of stuff that doesn't serve me, built up over many years, to reveal my true “great” self. When did life become so heavy and filled with negativity? Our children have got it right and I think that when we were kids, we had it right, too. So what that she was dancing in the rain and getting soaked? What really would have happened had I not opened up my umbrella to protect myself from the rainstorm? I highly doubt I would have melted….maybe a trip to the dry cleaners to dry clean my suit would have been the worst thing to happen. I understand and recognize that we must all grow up, mature and take on adult responsibilities. There is no way around it and we cannot stop the clock of life. However, living your lives freely and as carefree as my ten year-old, will give us the greatest chance to enjoy each and every moment that we are given in this short life of ours. I will always remember Annie's dance. I will always remember the smile on her face as she looked at me while she was having the time of her life. I will always remember her running up the steps to the front door with my warm towel and loving arms ready to warm her up. 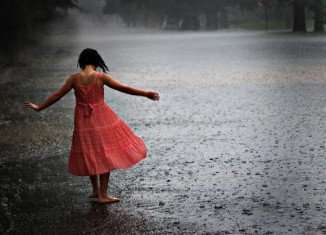 I will also remember that the next time she wants to dance in the rain, that there is room out there for me!